In 1782 a local farmer from Shottle, Thomas Slater, later known as Parson Slater, gave land for a chapel to be built at Belper on a site now known as The Cottage on Chapel Street. It is said that John Wesley himself visited and preached at a most unusual “indoor open-air” service, before the roof was completed. There is little evidence for this visit but it is known that Wesley visited the congregation again in 1786 and preached in the town. Within 25 years the building was too small for the rapidly growing congregation and work began on constructing a larger church on the adjoining land. The new building, which was opened on June 28th 1807, cost £3000 to build and it could accommodate 1400 worshippers. This was an ambitious project which used mill props to hold up the horseshoe shaped gallery which was pewed. The ground floor had forms for the use of the large Sunday School. 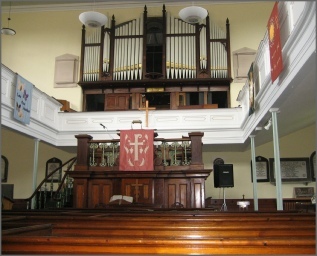 The Pulpit was high up on the west wall and below it was a large “singing pew” for a choir and band. A school room was added at the rear in 1841 and in 1873 the ground floor was pewed, the large Victorian pulpit erected, a new organ added and the present porch built. The Wesleyan Chapel, now known as the Central Methodist Church, is the oldest currently used place of orthodox Christian worship in Belper. It also has the longest continuously running Sunday children's work, begun in 1791 and still continued in the Sunday Club today. We believe that the 200 years of unbroken Christian worship and witness in the same building is well worth celebrating. The year 2007 has seen a full programme of special services and events when we commemorated the past, celebrated the present and looked forward to the future for our church family. CLICK on the cover of the ‘Heritage Booklet’ above to open the pdf file.